Tip: Whether they eat a school or home lunch, ensure that your children get the fuel and nourishment they need to stay focused and energized throughout the long school day. As summer winds down, we return to the rhythms of the new school year – early bedtimes, homework and the daily ritual of school lunch. Whether your children brown bag it or choose from the cafeteria menu, a healthy lunch gives them the energy they need to stay focused and perform their best throughout the long school day. Follow these tips to pack nourishing school lunches that are easy for you and fun for your kids. When you send lunch from home, you have more control over your child’s food choices – but kids don’t always eat what you send. Pack a nourishing lunch your kids will love to eat! 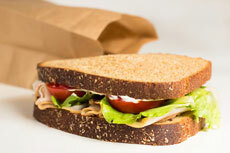 Power-Pack their Lunch – Pack nutrient-dense foods that provide energy to last through the long school day. Including protein, healthy fats and whole grains in every meal helps your kids stay alert and focused. Foods like hard-cooked eggs, turkey sticks, nuts and avocados pack a lot of energy in small, easy-to-eat items. Skip the Sugar – Foods high in sugar and processed carbohydrates, like white bread, crackers, processed fruit snacks, juice, and even most granola bars, put kids on an energy rollercoaster and leave them hungry and struggling to pay attention in class. Invest in a Bento– Bento boxes store food in separate compartments, making it easy to pack nourishing lunches that are fun to eat. Fill the compartments with a healthy protein, veggies, fruit and whole grains – a balanced lunch has never been easier! Plan Lunches Together – Involve your child in the planning so you – and they – know you are packing a nourishing lunch they will want to eat. Keep it Varied and Fun – Avoid burn out by rotating the lunch you send and presenting it in creative ways. Use cookie cutters to cut sandwiches or cheese into fun shapes. Include little notes from home in their lunch box. The possibilities are endless! With more schools implementing lunch programs that include whole foods and salad bars (for the older grades), it is easier than ever to choose a nourishing lunch at school. Empower your children to choose a school lunch that leaves them energized and focused throughout the day. Know the menu – Plan ahead so your child eats school lunch on days when the options are nourishing. On days when the menu is less nourishing, consider sending a home lunch. Review the choices together - Go over the menu with your child before school so you are both confident your child knows which choices will help them feel their best. Balance your plate – Teach your child what a balanced plate looks like – half filled with fruits and vegetables, a quarter protein and a quarter whole grains. Opt for regular milk – If your child drinks milk with lunch, encourage them to choose regular milk over chocolate, which contains twice as much sugar. Take advantage of the salad bar –Challenge your child to ‘choose a rainbow’ from their school’s salad bar, which ensures they are getting a wide range of nutrients. You form the foundation of your child’s food preferences at family mealtimes. The more nourishing foods you serve at home, the more likely your child will choose nourishing foods at school. Help your kids see the impact their lunch has on their mood, energy level and ability to focus. When they understand that a healthy lunch helps them feel better, do better on tests and perform better at their after-school sports, your children will be more likely to choose – and eat – a balanced lunch. You will love the way they feel!